Traditionalists are at war with free-marketers, and the far right's resentment is deepening. Is conservatism dead? Is the conservative movement dead? In November, when many of its leading intellectuals publicly abandoned the McCain-Palin ticket, deserting their comrades and going over to the other side, the movement suffered not only electoral defeat but ideological apostasy. During the transition, as the stock indexes of the world tumbled, crushing the blithe confidence in free-market ideas universally espoused just a few years earlier, many seasoned political observers wondered whether the long-awaited “conservative crack-up”–to quote the title of R. Emmett Tyrrell Jr.’s book of 1992, which predicted the imminent decline of the conservative project–might have at long last arrived. The old Reagan coalition had split into warring elements, with the traditionalists turning on the libertarians and Wall Street executives backing away from a Republican regime that proved to be inept at managing economic chaos. A movement that claimed to have descended from both Milton Friedman and Edmund Burke, wedding the fast pace of capitalism and the slow, stately march of tradition, might always have seemed ideologically strained. By the spring of 2009, the fissures had turned into cracks, and the movement collapsed in on itself. Or did it? After all, the death of conservatism has been prophesied many times before. In 1964 the New York Times opined that Arizona Senator Barry Goldwater had “not only lost the Presidential election…but the conservative cause as well.” In 1977 Fortune magazine pronounced that the Republican Party was “exceptionally weak,” virtually “bereft of any ‘turf’ that is securely its own.” Three years later Gerald Ford made a play for the Republican nomination by insisting that the country would never elect a movement conservative. “A very conservative Republican can’t win in a national election,” he told the Times. Even during the 1980s, when a genuine movement conservative occupied the White House, liberal journalist Richard Reeves declared Ronald Reagan’s politics a mere “detour” from the country’s liberal history. Perhaps this time things really are different, but the apparent rifts and tensions within the conservative movement–between elitism and populism, capitalism and custom, the piety and fanaticism of the far right and the moderation of the old guard at the helm–have not caused dissolution, historically speaking. On the contrary, they have generated a strangely durable, tenacious politics that has avoided being shunted to the margins of American life. Goldwater may have been trounced in 1964–he lost every state except his own and the five of the Deep South, where voters were drawn to his opposition to the Civil Rights Act–but movement conservatives remained undeterred and ended up using his campaign’s donor lists to fortify the ranks for future battles. Four years later the Republican Party, which had seemed a shambles during the Johnson presidency, retook the White House. When Richard Nixon left Washington in calumny in 1974, it seemed, again, that the GOP would be weakened for a generation. Instead, Reagan defeated Jimmy Carter in 1980 and was re-elected in a landslide. For conservatives, it seems that their most crushing defeats herald their greatest victories. Given these Houdini acts, it is surprising that until recently there has been no significant body of scholarship on the history of postwar conservatism. In 1994 historian Alan Brinkley observed that the right had become “something of an orphan” in American political history. Most scholars–themselves liberals–believed that liberalism had triumphed in the United States over the course of the twentieth century. The disparate regional cultures of the country had been unified into one cosmopolitan nation. Ever since World War I and the Progressive Era, Washington had assumed greater management of the economy, culminating in the New Deal and later in the War on Poverty and Great Society programs. The Manichaean, parochial world of religious fundamentalism had given way to the subtle moral distinctions of modernity. Brinkley suggested that if scholars had overlooked the lingering sway of market ideology, the pervasiveness of antigovernment sentiment and the sustained vibrancy of fundamentalist Christianity, it was because they were utterly convinced of liberalism’s triumph. Such assumptions left them unable to reckon with the lasting power of conservative politics and therefore incapable of understanding the collapse of the New Deal electoral coalition and resurgence of the right in the 1980s. Fifteen years after the publication of Brinkley’s article, the conservative movement is no longer an orphan in the academy. Indeed, writing its history has become something of a cottage industry, with every year bringing new monographs, articles and dissertations on a dizzying array of subjects: right-wing populism among long-haul truckers; the grassroots religious conservatism of Southern preachers who migrated to California in the postwar period; the role of Phoenix, Arizona, in the rise of laissez-faire ideology in the Republican Party; the intellectual influence of Ayn Rand; gay and African-American conservative thought; backlashes in communities ranging from Baltimore to Orange County; anti-unionism in American culture; histories of far-right preachers and the leaders of organizations like the John Birch Society. As someone who has written about conservatism, I think that while the field has flourished for intellectual and professional reasons (nature, one might say, abhors a vacuum in the scholarly literature), there are political causes for its growth as well. The body of scholarship on the right grew as the movement leapt from one success to the next. Many (although not all) of the younger historians writing about the right are actually left of center, children of the Reagan era who came of age as scholars during the Bush years and have sought to understand the conservative movement partly to forge the tools to undermine it. This groundswell of rich and complex research has allowed a thousand monographs to bloom, but it has yet to produce a retelling of the larger narrative of the postwar period incorporating the insights of recent histories of the right–something on the order of James Patterson’s powerful synthesis of postwar American history, Grand Expectations. And there have been few efforts to understand what the history of the right has to tell us about the movement’s influence today, or its future, which is especially important at a time when conservatism has found itself on the defensive once again. Before Reagan’s election in 1980, academic scholarship about the conservative movement was meager. There were a few books on topics like the right in the 1930s, the history of McCarthyism, the Ku Klux Klan and the isolationist politics of the far right, but most academic historians spurned the subject of conservatism. The right was seen as a relic of American history–a menagerie of resentful oddballs and misfits, fanatical preachers, eccentric racists and assorted cranks who rejected the New Deal and the Great Society. This patronizing view followed from that of the “consensus” historians of the 1950s, such as Columbia University’s Richard Hofstadter, who interpreted McCarthyism as the vicious politics of “status anxiety.” According to Hofstadter, the paranoia of the right was fed by the resentment of members of social groups whose fortunes were declining in the newly prosperous mass-consumption society of the postwar era–“so many people do not know who they are or what they are or what they belong to or what belongs to them,” Hofstadter wrote in “The Pseudo-Conservative Revolt”–and who turned to the politics of conspiracy in an anxious attempt to shore up their sense of moral virtue. These “pseudo-conservatives” believed they were powerless victims menaced by evil outsiders, and they lashed out angrily at their perceived enemies, confident of their righteousness. More generally, in the 1970s and ’80s scholarship on conservatism was scarce because old-fashioned political history was in decline: the study of culture and social life began to eclipse the analysis of elections, protests, strikes and legislative battles. But Reagan’s election reawakened scholarly curiosity in the conservative movement. How could such hostility to government, such opposition to the tolerant, pluralistic politics of liberalism, such a belligerent temperament thought to be moribund, suddenly re-emerge at the center of political life? The first generation of historians to take conservatism seriously focused closely on the politics of social backlash. The main characters of their stories were the working-class white voters of Northern cities and the South who had grown alienated from a Democratic Party that they thought was overly solicitous of African-Americans. They were angry about welfare, school busing and affirmative action–policies they felt helped people less deserving than themselves. More deeply, they were frustrated by the radical politics of the 1960s: the longhaired kids protesting Vietnam, the hippies slouching in parks, the feminists with the temerity to blame the nuclear family for their oppression, the black-power advocates with their clenched fists and ten-point programs. The recession of the 1970s drove these blue-collar workers away from their old faith in the power of the state to safeguard prosperity. Most of the scholars who wrote about these reactionaries–such as Jonathan Rieder in Canarsie (1985), Ronald Formisano in Boston Against Busing (1991) and Dan Carter in The Politics of Rage (1995)–were far from sympathetic to their subjects; their commitments lay with the African-American families who sought to integrate the schools of white neighborhoods. Nonetheless, they endeavored to present their subjects as working-class people in a time of economic decline, desperate to protect the few institutions–home, family, school and neighborhood–over which they had control. As Rieder put it in his study of the backlash in Brooklyn, “The basic fact of life for the residents of Canarsie was the precariousness of their hold on middle-class status, the recency of their arrival in that exalted position, and the intense fear that it might be taken from them.” In this, Rieder and others shared a set of assumptions with the 1950s historians of McCarthyism: they treated conservatism as a populist politics of displaced frustration, in which rage at liberalism reflected anger about the underlying problem of increasing economic insecurity. During the years of Bill Clinton and George W. Bush, historians turned away from an emphasis on working-class reaction against the social radicalism of the 1960s. While the backlash might explain why the New Deal electoral coalition collapsed and how Reagan won the presidency in 1980, studies of the Boston busing crisis and the protests over school curriculums in West Virginia’s Kanawha County could not offer a convincing explanation of a more longstanding shift that had occurred in American politics. Why had the right proved able to win one election after another? How was it able to exercise such influence even when Clinton reclaimed the White House for the Democrats? Backlash histories were at heart local accounts of liberal decline, not synthetic analyses of conservative ascendancy. They could explain changes in voting patterns but not the rise of a new political force. A new generation of historians began to shift the focus away from the politics of resentment and toward movement conservatism, not only in Washington but across the country. Many focused on the social origins of the conservative campaign. Here, the main actors were a group of “suburban warriors,” to quote historian Lisa McGirr–prosperous, upwardly mobile men and women who carefully organized in support of a right-wing agenda by knocking on doors, distributing literature, screening films and holding meetings. They were driven not by irrational fears or anxieties but rather by a deeply held set of beliefs about how society ought to be organized, with anticommunism at the forefront of their politics. Far from being socially marginal, they were among the postwar economy’s winners, and their politics reflected their sense of entitlement. They used the same kinds of strategies familiar to any left-of-center social movement, but for dramatically different ends. Much distinguished this second, younger generation of scholars from historians like Carter and Formisano. The first generation wrote primarily about cities and the South, the second about suburbia. The first focused mostly on specific episodes or campaigns, while the second took a much longer view that often spanned the entire postwar period. But perhaps the biggest interpretive difference lay in their respective approaches to the tumultuous years of the 1960s. Those writing in the wake of the Reagan revolution had shared the vivid hopes of 1968 and the subsequent disappointment of those dreams. The radicalism of the decade and the backlash it had provoked still seemed to be the central events underlying the conservative shift. For some, the New Left’s inability to moderate its strident moralizing and appeal to a broader public made it tragically culpable for the ultimate failure of consensus liberalism–the left had been unable to speak to working-class Americans, who turned instead to the right. For others, the clash simply revealed the intractable racism endemic to segments of American society, meaning that there was no particular tactical failure on the part of the left. Yet most of these earlier scholars, who focused on the collapse of the New Deal electoral coalition, agreed that the modern right was born in this furious, embittered reaction against civil rights, feminism and the antiwar movement. By contrast, the newer wave of scholarship–books such as Jonathan Schoenwald’s A Time for Choosing (2001), McGirr’s Suburban Warriors (2001) and Rick Perlstein’s Before the Storm (2001)–granted a much smaller place to the fiery emotions of the years of George Wallace, Jane Fonda and Bobby Seale, emphasizing that in important ways the conservative movement actually predates the 1960s. Far from being a sudden, explosive and negative reaction to the decade’s tumult, the conservative movement simmered throughout the postwar period, motivated by its activists’ positive vision of small government, the perfect social ordering promised by the free market and a world without communism. 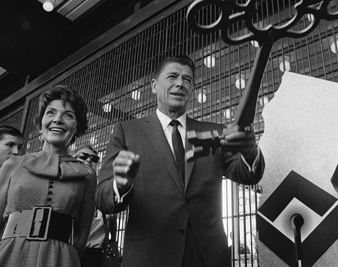 The social crises of the 1960s may have offered the movement an opportunity to broaden its base of support, but conservatism was thriving before that upheaval. The earlier generation of scholars, after all, never did explain how thirty years of conservative politics could have sprouted from a few explosive conflicts in the 1970s. Nor could they elucidate how the blue-collar workers who cheered for George Wallace wound up supporting a politics committed to promoting the free market, fighting unions and rolling back the welfare state. How had the politics of blue-collar resentment and fear of social change come to be joined to the stridently laissez-faire agenda of the movement faithful? To understand the connections, it was necessary to look at the rise of the conservative movement on its own terms–to study its internal logic, its intellectual history and the way its activists promoted their agenda. Yet at the same time, although the second generation of historians made clear that the victory of conservatism was no mere accident of history but instead proof of a longstanding, concerted effort to shape American politics, their vision of the movement as simply another grassroots mobilization seems vexed. In their attempts to write respectfully about the conservative movement (many are still warring with Hofstadter’s description of it as a paranoid politics), some of them risked smoothing over the baroque strangeness of the American right–such as the way that its prosperous believers and leaders portrayed themselves as aggrieved victims, or its searing hostility to government, to unions and even to the most minimal welfare state. Moreover, both schools of historical interpretation share a sense of the conservative movement as in some sense populist–a trope that dates to writers like Hofstadter and that is also shared by many conservatives. The earlier generation of writers emphasized the anti-elitism of the backlash, while the later one suggested that the right gained strength by using the same social-movement organizing strategies that the left had employed. The image of conservative populism has penetrated deeply into everyday political chatter as well, thanks in no small part to the efforts of conservatives, who–as Thomas Frank argued in What’s the Matter With Kansas? (2004)–have long sought to claim theirs as a plain-folks, common-sense mobilization against effete social dreamers. When Barack Obama spoke before an audience of wealthy donors in San Francisco in 2008 about the challenge of winning over Rust Belt towns in Pennsylvania, where voters clung desperately to “guns or religion or antipathy toward people who aren’t like them,” he was invoking this familiar image of populist working-class conservatism. But this raises a larger question: is it correct to see the conservative ascendancy as a populist mobilization akin to the civil rights or labor movement? Some parts of the movement–like antiabortion activism–do seem similar to left organizing projects: they use direct-action strategies and cultivate grassroots commitments. Moreover, from the John Birch Society members who sought to imitate the communists they so hated and feared to the businessmen of the National Association of Manufacturers who wanted to mimic the labor movement’s methods of organizing, there has been much self-conscious discussion among conservatives about learning from the left. And the simmering resentment that fueled the backlash against the civil rights movement and other social movements certainly helped shift voters away from the Democratic Party in the 1970s and ’80s. Still, it is hard to see the mobilization and political education of a massive number of people as critical to the actual victories of the right, the same way that it must be for any movement that seeks to challenge social hierarchies in a sustained way. For unions to organize in the 1930s, it was not enough for Congress to pass the Wagner Act–workers needed to put their livelihoods and lives on the line. For segregation to end, ordinary men and women had to come to the point of being willing to break the law or even risk losing their lives. Does it really require the same kind of commitment to cut taxes, end regulations or fight labor unions? And if it doesn’t–if the way the conservative movement harnesses the discontent of its constituency is largely limited to certain moments of political theater, when the image of mass support is needed to garner television coverage–shouldn’t we ask whether populism really is the backbone of the right at all? The most recent scholarship about conservatism in the late twentieth century has taken a new direction. It has emphasized political economy instead of movement politics, looking at such topics as the development of Wal-Mart’s distinctive free-market evangelism (Bethany Moreton’s To Serve God and Wal-Mart, from 2009); the origins of laissez-faire revival in the development politics of Southwestern cities (Elizabeth Tandy Shermer’s dissertation “Creating the Sunbelt: The Political and Economic Transformation of Phoenix, Arizona”); and the organic emergence of a populist anti-statist politics among groups like rural long-haul truckers trying to avoid regulation (Shane Hamilton’s Trucking Country, from 2008). Implicitly, this new body of work raises the question of whether the reasons for lasting conservative success might be related to deeper economic changes in the country. Perhaps the age of liberalism that followed World War II depended on the prosperity of a vibrant manufacturing economy (and wartime Keynesian spending) that has mostly vanished. The rise of a competitive service-oriented economy has created a new kind of voter with changed economic interests and a different relationship to politics–one to whom the old liberal vision no longer appeals. Perhaps conservative leaders enjoyed electoral success because their movement has simply been better able to adapt to deep changes in the bedrock of American society. At the same time as they have started to emphasize an account of the transformation of the country’s political economy to explain the durability of the conservative movement, historians have also started to describe postwar liberalism and its many triumphs with skepticism, if not pessimism. (While this interpretation goes back to the New Left, it has gained new strength today, even though there is also a countermove by historians like Kevin Mattson to rehabilitate postwar liberalism as a fighting faith.) Some scholars suggest that the entire postwar period was one of struggle and that the liberal order was always more fragile than its victories suggested. The North never truly supported racial equality, at least when it came to its own cities; the manufacturing companies so long thought to have given tacit support to the New Deal now seem to have done all they could to resist and fight it behind the scenes. Instead of a liberal period of consensus that was shattered in the late 1960s and ’70s, there was a continued struggle throughout the postwar period over the legacy of New Deal liberalism. Others go further still, arguing that the culture and society created during the postwar era contained elements that would prove fatal to liberalism. After all, the government underwrote the expansion of suburbia, which would become the home of an intransigent individualism hostile to the very state that had subsidized its creation. And the liberal project itself never had deep philosophical or cultural roots. It was created during the Great Depression out of expediency, in a moment of economic and political crisis, and never reflected a sustained or coherent agenda; even FDR was ambivalent toward labor and the welfare state. More than anything else, postwar liberals were committed to anticommunism–hence their support of the Vietnam War. The entire postwar era (as Jefferson Cowie and Nick Salvatore have explained) might be seen as no more than a “long exception” to the more lasting conservative project of individualism and laissez-faire that has defined so much of American history. Another version of this story can be found in the world of intellectual history–for example, in Patrick Allitt’s The Conservatives: Ideas and Personalities Throughout American History (2009). Here, conservatism is analyzed as one of the deep trends within the country’s political life, a “reactive” politics that seeks to respond to “perceived political and intellectual challenges,” to conserve what exists, to protect against social dissolution and to resist the march of social and political equality. In this view, the post-1945 conservative movement is one more development of a strain of politics reaching back to the founding fathers. Unlike historians who have noted how the modern conservative movement–in its determination to tear down the New Deal and its preference for a radical market vision rather than a cautious enthusiasm for capitalism–seems to break with the earlier style of conservatism, Allitt emphasizes the continuities between postwar conservatism and the laissez-faire politics of the nineteenth century. When Alan Brinkley observed that American historians had lost interest in the right, the general interpretation of the United States in the twentieth century was one of liberal victory followed by tragic decline. Today a new vision seems to be emerging–one that sees the liberalism of the midcentury as always hemmed in by hostility and limited by its internal tensions. In the latest scholarship, the old narrative has been turned upside down: more and more, historians are depicting the century as one of conservative strength only briefly interrupted, some going back still further to see all of American history shot through with the power of forces sharply opposed to equality and democracy. Yet just as the earlier story of liberalism triumphant overlooked the continued existence of a conservative opposition, this bleaker vision may also be too stark. It comes close to substituting a new monolithic political force for the old one and eliding the reality of continued struggle, in which the two sides shape each other and the outcomes are controlled by neither alone. The next wave of scholarship on the history of the right will likely strive not only to tell the story of the movement’s rise but also to account more fully for its internal tensions and the difficulties that it encountered–especially once it came to power in the 1980s. What does recent historical scholarship say about the future of the right? On the one hand, there undeniably is a crisis–of leadership, of faith, of constituency–among conservatives at this point in history. Although the movement institutions (think tanks, talk-radio stations, churches) remain powerful forces, they are also catering to a narrow and frustrated segment of opinion. The far right’s resentment is deepening: it angrily denounces Obama as a socialist, holds “tea parties” to protest taxation and has turned to Rush Limbaugh as a leader. “Birthers” seek to delegitimize the Obama presidency by attempting to prove that he was born in Kenya, not Hawaii. True believers on the right seem to be sinking deeper within their movement, insisting that George W. Bush failed to adhere sufficiently to first principles but never considering whether the principles themselves were the problem. Yet as they consolidate their faith, they also become more marginal, less a central part of American politics. But this attempt to reinvent the right is fraught with difficulty. Leaving aside the question of whether Burke–who wrote in the heat and fury of counterrevolution–really held such genteel commitments, it is hard to make the case that the American conservative movement can easily be divided between moderates in the Burkean mold and radical reactionaries. Brooks’s and Tanenhaus’s turn to Burke recalls George Nash’s 1976 classic The Conservative Intellectual Movement in America Since 1945. Like many conservatives who tell their own history, Nash placed the greatest emphasis on the history of ideas and the fusion of traditionalist, anticommunist and libertarian strains of conservatism. By portraying a conservative world teeming with ideas, he was able to refute the enduring 1950s image of conservatism as intellectually dead, even as he glossed over the social and political bases of the movement. Indeed, as Tanenhaus has written, the people who have always determined the course of American conservatism have been the passionate ideologues, the “revanchists” who are less interested in what they can “conserve” than what they can raze. Although Tanenhaus has argued that left-leaning social historians, having abandoned intellectual history, are ill equipped to understand the appeal of conservative ideas, the project of inventing a tradition of conservative intellectual moderation as the road not taken for American politics seems to have more to do with the present dilemma of the movement than with historical inquiry. That Brooks and Tanenhaus find the motif of Burke appealing is largely a sign of their longing to revive a serious, sophisticated and mature conservatism, and their sense that, thanks to the radicals, the right is in desperate straits and has entered a period of decline. This situation holds a special irony for Tanenhaus, who believes we are living in a conservative era, “perhaps the most conservative since the Eisenhower years,” as he writes in his new book, The Death of Conservatism. But this narrative of conservative defeat and retrenchment–tightly focused on backlash politics and movement conservatism–is only one part of the story. The recent turn in scholarship toward economic change offers another way of understanding the fate of the movement. For despite the financial crisis of the past year, the faith in laissez-faire that conservatives promoted throughout the postwar period continues to exercise a deep hold on American politics. Think tanks, business organizations and corporate lobbying groups still wield great influence in Washington and throughout the country, their confidence hardly shaken by the disasters that their politics helped bring about. Wealthy individuals who financed the movement are still donating their dollars to fight healthcare reform. Companies such as Citibank are battling labor-law reform even as they take bailout funds. The self-righteous chutzpah of bankers who insist on paying themselves tremendous bonuses even after driving the country into financial turmoil reflects the triumph of an ideology in which the private sector can do no wrong. And the economic assumptions that the conservative movement advanced throughout the postwar period continue to prevail in our culture and politics overall, where it is hard for people to imagine a check on, much less an alternative to, a merciless market-driven world. Even the Obama administration is well stocked with Wall Street veterans and economists committed to preserving high-octane financial capitalism. History has a strange way of rescuing the defeated. As a self-conscious movement, conservatism has sunk into one of the deepest crises in its history. But it may be only in this moment of apparent ruin that we can for the first time assess the full significance of all that the right has won.